June 2015. Client: Business In The Community. Seeing Is Believing. They say never work with animals but this dairy cow was a pro and a must for all farmyard shoots. When I shouted “Hey Ermintrude! Stop nibbling Neil Khandke, Group Technical and Compliance Director of Dairy Crest!” she coyly went back to her post after expertly lightening the mood of the shot. I continued “Neil is here to lead a visit to engage businesses on the importance of stewardship of the natural environment with a particular focus on water, doncha know?” but it was met with Friesian indifference. As well as interacting with the cow I moved the camera to get a more striking perspective with the feeding trough, giving the shot a dynamic vanishing point. 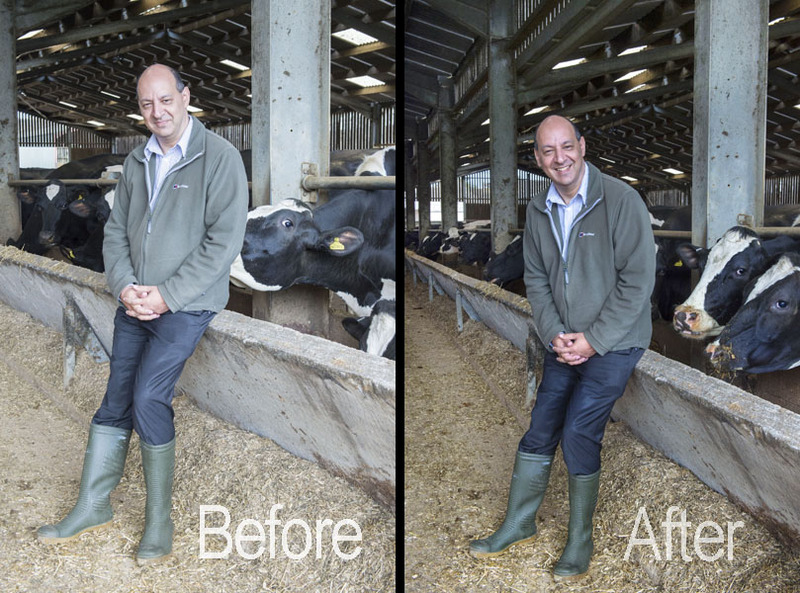 The subject (Neil, not Ermintrude) is also framed better within the cow shed columns. Afterwards I made the shot more contrasted and saturated which you can see easily by comparing the straw in each image.